So , how much does this all cost ? A screenshot from our garmin tracker (made after sailing to the Canary Islands, so that explains those dots on the left). Our road trip was basically one large triangle done clockwise, starting and finishing in Rabat. 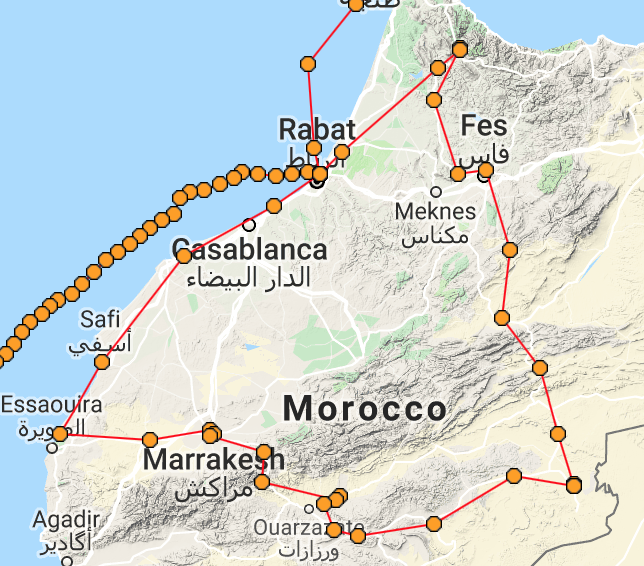 The last few weeks we have received several messages from other sailors wishing to visit Morocco and asking where we’ve been and how we’ve arranged our road trip. For their convenience – and yours! – I’ll list below our full itinerary. Our trip was 12 days from start to finish. We’ve thoroughly enjoyed Morocco with its stunning landscapes and friendly people and if you’re contemplating going there I wholeheartedly recommend that you do! You won’t be sorry! Feel free to copy in full for a hassle free road trip without having to research everything yourself, or pick and choose what you like and leave out what you don’t, or use this as an inspiration to plan your own road trip with. Please know that some of these accommodations can be basic (sometimes a little, sometimes a lot). We were fine with that and we had a fantastic time! But if you are not, you might want to look into other places to stay. Even if our trip did feel quite intense and possibly rushed at times – driving several hours a day and only staying in most places for one night meant little time left to fully explore some locations – I personally felt we made the most of it and have seen a lot of the country in a short amount of time. But I would recommend learning from our experiences and urge you to stay longer in some places (like Errachidia with Ali) and skipping some others (like Marrakesh. Absolutely do consider skipping Marrakesh) to make your road trip even better than ours! Read about our experiences in the blog posts Amazing road trip in Morocco, a multi part series about the places we visited and what we liked and didn’t like. First things first: we sailed to Rabat (check out our Guide to sailing to Rabat here) and stayed in the marina Bouregreg for the full extend of our stay. We did not sail to other places in Morocco but chose to rent a car and go inland instead. We had no problem leaving our boat while going on our trip inland. Security is very good in this marina. We simply told the marina staff about our plans and when we’d return. We rented a car through the marina instead of contacting a rental company ourselves. This was mostly due to the period of national holidays while we were there; most companies were closed or hard to reach. The marina staff were very helpful and rented a car for us. We paid 300 dirham per day (25/27 euro) including insurance for a Dacia Sandero. I booked all the accommodations in advance using Airbnb, with two exceptions: our stay in Merzouga I booked using booking.com. The night in the desert was arranged by the owner of the kasbah in Merzouga. I used A Two Week Morocco Itinerary You Should Steal from heartmybackpack.com as an inspiration while planning our trip, so you’ll see a lot of similarities. Note: If a backpacker/hippy vibe (if you know what I mean) doesn’t sit well with you, you might be better off staying somewhere else, but if you don’t mind that, this is a great place to kick off your Moroccan road trip adventure. Note: if you decide to visit Ali, please know he is not actually IN Errachidia but coming from Fez he is in the Gorge of Ziz near (3 km) a hotel called hotel Jurassique. If you let him know when you are coming he’ll be waiting for you at the red mosque (but a lot of mosques are red inland so….). Please don’t make the mistake we did driving all the way up to Errachidia only to turn back again. And if you can, Ali would love for guests to bring notebooks and pencils and some other school supplies for a nearby school. We didn’t know or we’d done the same. He’s a lovely host and guide, studies Biology at the university and knows the area well as him and his family are/used to be berber nomads. He taught me to make tagine. If you have time, stay here longer than we did. Ali will gladly show you around! Day 5 – Desert bivouac arranged by Youssef of the kasbah in Merzouga. Note: Youssef is a very nice host, brought us tea in the afternoon and let us use a room for a nice hot shower after our desert trek even though we only booked one night. He arranged the trek for us, no hassle on our part! There are a lot of people offering trips to the desert sometimes for ridiculous prices, but know that the one we went on was VERY basic. We paid 350 dirham per camel, renting two camels. This included a stay in the camp and a basic tagine + tea for dinner. Note: Highly recommend, this place is ridiculously beautiful and the owner Hassan is very nice. Best food we had all trip we had here. Several films have been shot in here. Note: Because we needed a little break we stayed 2 nights at this lovely place, with a pool for the girls. Very nice and rural with liberal owners, so you can order a beer here. And they have turtles in their yard. No airbnb but we did drive to the solar power plant here. There is also a movie studio with huge outdoor sets there that you can visit (we didn’t). Note: Nice easy seaside town, excellent handmade woodcrafts, we ended up staying 2 nights with this very nice lady originally from China. She used to be a journalist in Hong Kong before quitting her job and moving to Morocco 7 or 8 years ago. She’s very outgoing and a nice host ready to give information or guide. Day 12 – Drive back to Rabat. We returned the car the next day (after we drove to a car wash. Our car was DIR-TAY!) and that concludes our epic road trip. Enjoy your stay in Morocco! If you end up following in our footsteps, please send us a message letting us know about your experiences!